SAP HANA 2, now even more innovative and capable! SAP finally announced the next generation of SAP HANA Platform, SAP HANA 2. Based on the key features and enhancements; SAP HANA 2 will keep supporting the digital transformation using the latest in-memory technologies and with additional optimizations to spend less time for platform maintenance, it will provide more opportunities to focus more on innovation and adopting new technologies. SAP HANA 2 combines your infrastructure into a single platform and help you to run a modern in-memory platform in the cloud or on premise (like before). It provides additional high availability, security and administration features. You can also equip your developers with expanded analytical tools and processes to power real-time business operations and different types of data (text, graphic, stream data etc). SAP HANA 2, helps developers to build and deploy next generation applications with its enhanced application server capabilities and expanded development toolsets. So the new features delivered with SAP HANA 2 are mainly focused on innovation of data management, analytical intelligence and application development fields. Should I consider SAP HANA 2 now? SAP HANA 2 is mainly optimized for business innovations and delivers the enhancements twice a year (so 2 SPS every year). If you need an environment with a longer maintenance period with minimal innovations (and only maintenance updates) it would be better to stay on SAP HANA SPS 12 which will be maintained until May 2019. 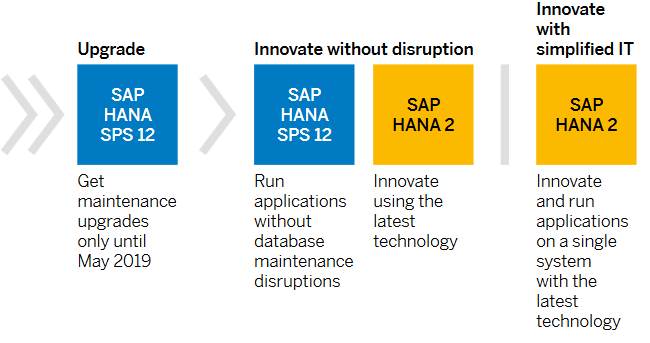 SAP HANA SPS 12 offers a “3-year maintenance track” while SAP HANA 2 introduces the new “innovation track”; and the decision really comes down to your business requirements. Are you ready to adopt more innovations or prefer the maintenance of existing platform? I believe it might be a bit hard for large scale businesses to switch to the innovation track for now. Remember both SAP HANA 2 and SAP HANA SPS 12 are capable enough to handle mission-critical applications. The custom development objects will function as they do now. SAP applications will run on SAP HANA 2 upon validation after SAP HANA 2 becomes generally available. It is also possible to upgrade your applications from SAP HANA SPS 12 to SAP HANA 2 to take advantage of new functionalities anytime you want. Keep in mind that moving to SAP HANA 2 is a simple upgrade, not an entire database migration. You can perform the upgrade directly from SPS 10, SPS 11 and SPS 12. However, if you are running older versions of SAP HANA, upgrading to SPS 12 first will allow to test the production workloads on SAP HANA 2 before upgrading. So you would have a clear picture and that really helps to make the best decision for your business.